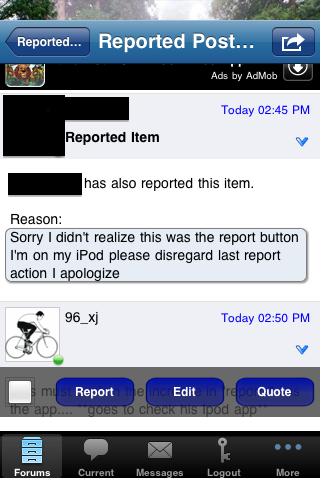 Lately there has been an increase of members using the mobile app for iPhone and Android accidentally reporting posts, instead of replying to them. It is not yet clear as to the confusion, but it seems that the interface (at least for iPhone) makes it a little confusing and the "report" and "reply" buttons can be mistaken. This results in a notice being sent to all of the staff members. Since many users are noticing that their reply is not there they continue to hit the report button, and this clutters up the staff area. Please use this thread to voice concerns about this issue. You're participation will help us figure out exactly what is going on so that we can work together towards a correction. Note: When replying, please let us know what phone and version of the app you are currently using. Last edited by nukinfuts29; 04-24-2011 at 12:36 PM. maybe move the two buttons a bit further apart? Your not the only one at all. What phone and version of the app are you using? Is this app. also for blackberrys? I have the iPhone but not to sure what app it is I would think it is what ever the newest app is because I have only had it a few weeks now. The only problem I have had is it shutting down on me from time to time other then that seems to work good for me. Damn, I just tried to report this and it came back with an unreportable error due to an outdated plugin. 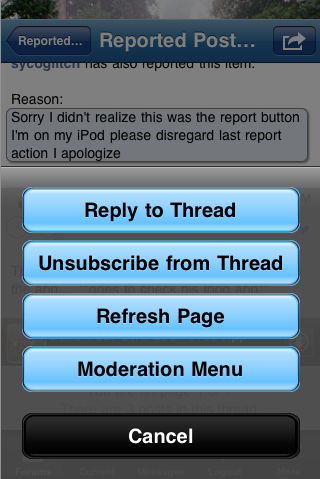 What I dont get is for all you iPhone/iTouch users how you get the report and reply to thread buttons mixed up... they are in 2 separate windows..